There is only one thing holy, that’s Jesus Christ, the Son of the living God, Who has been made Perfect. And our requirement is to be perfect. Now, how we going to be it? 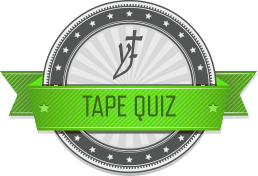 If you would like to take the quiz, simply click on the link, close the popup window (if you are not signed up in YF), and click on the correct answers. Then submit your answers. But I believe in the supreme authority of the local assembly. Yes. Let each church be its own, choose its pastors, its deacons, its, whatever it is. And then, that way, the man in there has no bishop over him. The Holy Spirit wants to speak something to that church, they don't have to ask anybody about whether they could do this or do that. It's the individual in contact with the Holy Spirit. Show me by the Bible what's greater, in the Bible, than a local elder to a local church? That's right, yes, sir, the sovereignty of the local church, each church in itself. Now, no matter what kind of an experience you ever have, church, I want to ask you something. No matter how good it looks, how real it seems, it first must be tested by the Bible. Always on the Word! Don't never leave That, for any kind of experience. Oh, I know there's many rise up and go out and say, "Oh, I don't need to go to church anymore. Praise God, the Holy Ghost has come, He's the teacher." When you get that idea, you're just wrong. For why did the Holy Ghost set teachers in the church, if He was going to be the teacher? See? There are first apostles, prophets, teachers, evangelists, and pastors. The Holy Spirit set teachers in the church, so He could teach through that teacher. And if it--it isn't according to the Word, God doesn't confirm it, then it isn't the right kind of teaching. It must compare with the entire Bible, and be just as alive today as It was then. There's the real thing made manifest. Therefore leaving the principles of the doctrine of Christ,... What's he saying? All these first five chapters has been laid on Christ, to show who He is. Now we're leaving those principles of the doctrines of Christ. And so, therefore, Melchisedec, the great Priest, like a man, He had no beginning and He has no end. And when we, through that theophany, that, we were made in the image of God before the world was ever made; when that theophany has been made flesh and dwelt among us, then, through His death, we ourselves receive His Spirit and we have no end; Eternal Life; not Angels, but men and women. Oh, I... Somehow, if I could only get it in a way that my--my audience would catch it! You will never be an Angel. God made Angels, but God made man. And what God does is off of God, which is as Eternal as God is. And man is just as Eternal as his Creator, because he was made from Eternity. Watch this. Let's get this word "perfection." Do you know there's only one way you'll stand in the Presence of God? That's, perfect. God cannot tolerate unholy things. So who can say that this is holy and that is holy? There is only one thing holy, that's Jesus Christ, the Son of the living God, Who has been made Perfect. And our requirement is to be perfect. Now, how we going to be it? They say, "Nobody can be perfect, the Bible said, 'There is none perfect.' There's your contradiction." Is it? All right. You cannot be perfect in yourself. If you're trusting in what you done, you're lost. "The law having a shadow of good things to come," all the ordinances and the baptisms and the... all the other things they had, "could never make the worshipper perfect." And, yet, God requires "perfect." You being a good, loyal man, will never make you perfect. You can't merit one thing. There's nothing about you, to merit. You are lost. You say, "Well, I kept the law. I keep the sabbath. I keep this, all the ordinances of God. I do this." Paul said, "Let us lay aside all those things now." How do we get into It? Romans 8:1.There is therefore now no condemnation to those that are in Christ... that walk not after the things of this world, the flesh, but after the things of the Spirit, that pay no attention to what the world has got to say. Oh, how perfect and solid we can stand, this morning! How you can look, if death is staring you right in the face, you could say like Paul, "Death, where is your sting? Grave, where is your victory? But thanks be to God, Who gives us the victory through our Lord Jesus Christ." If you're a Christian, this morning, 'cause you belong to church, you're lost. If you're a Christian because you've passed from death unto Life, you're free from judgment; into Christ, you're becoming into perfection all the time. God cannot see one thing. You say, "Well, will I ever make a mistake?" Sure, but you don't do it willfully. Friends, "Let us go on to perfection." We have... we're not... We're without excuse today. We have no excuse, at all. The God of Heaven has appeared in these last day and is doing the very same things that He did then, when He was here before, when He was on earth. He has proved, as we're coming through this Bible. And you--you, class, know this, that we have taken miracle by miracle, and sign by sign, and wonder by wonder, that He did with the children in the wilderness, the things and signs that He did; the things that He done when He was here on earth, manifest in the flesh; and the very same things are taking place today, right here among us. Here is the Word to vindicate it. Here is the thing to say it's right, to make it right. Here is the Spirit of God to do the same thing, so we're without an excuse. You cannot see this through x-ray, because it is a cell, and it’s life. If the Spirit doesn't liven the Word and make It a reality to you, then the letter is just _______. Brother Branham believed in the supreme authority of the local pastor. What is a perpetual memorial through every generation? Oh, in this great hour of darkness and choas over the earth, we should be the ______ people in the whole earth, to rejoice, to know. These first five chapters are ________ Jesus as High Priest. "Though he were a Son, yet learned he obedience by the things which he _______ ;"
For every one that uses milk is _______ in the word of righteousness: for he is babe. Man is just as Eternal as his Creator, because he was made from Eternity. Forever has a distance or a time limit. But Eternal is perpetual, it has no beginning or end. What did Brother Branham say this was like? "Therefore leaving the _______ of the doctrine of Christ, let us go on to perfection..."
You are not judged of God until after you breathed your first breath. Aaron the high priest had to have _______ in his hand when he went in the tabernacle. If he went without that, he died as soon as he moved the veil back. How many times did Jesus enter into the holy place, having obtained eternal redemption for us? "What do you care what the world thinks? What do you care what your neighbor thinks? Our ______ has died, and we're regenerated and born again by the Spirit of God, to serve the true and the living God." Where does Brother Branham take this quote from in the Scripture? "There is therefore now no condemnation to those that are in Christ... that walk not after the things of this world, the flesh, but after the things of the Spirit, that pay no attention to what the world has got to say." How do you get into perfection? God is the only One is Eternal, and God is the only One perfect. And the only way you can be Eternal, is ______. The worshipper once ________ has no more conscience of sin. When the new Birth is come, you are changed. You don't have to do anything to prove it. Your _______ proves it, as you walk. Here are the current quiz results for Hebrews Chapter Five And Six #1. Anyone taking the quiz after Sunday, October 19, 2014 will not have their score posted.